1. Solve the system of equations. 2. John can mow his lawn in 3 hours and his sister, Julie, can mow it in 2 hours. How long will it take them to mow their lawn if they work together? 4. Factor the expression completely. 5. Solve the equation for x. 6. What should be added to both sides of the equation x2 – 12x = 5 in order to solve it by completing the square? 7. Find the vertical asymptotes of the function. 8. Two cars are traveling north along a highway. The first drives at 40 mph, and the second, which leaves 3 hours later, travels at 60 mph. How long after the second car leaves will it take for the second car to catch the first? 9. What is the domain of the function f(x) = 2x – 4? 10. Solve the equation for x. 1. C. Notice that the given system has two equations, and each equation has two variables, x and y. Therefore, the solution of the system of equations will have values for each variable. Since the first equation already has y isolated on the left side, it will be easier to use the substitution method than the elimination method to solve the system of equations. To begin, substitute the left side of the first equation, –3x+4, for y into the second equation, and then solve for x. To find the value of y, substitute 2 for x in the first equation. Therefore, the solution of the given system of equations is x = 2,y = –2. 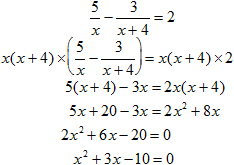 Check this solution by substituting the values into the second equation and making sure the resulting equality is true. 2. A. Using, rate x time = amount, determine the rate at which John and Julie each mows the lawn if they work separately. To make the calculation easier, rewrite the formula as . Next, if John and Julie work together, their total rate can be found by adding the individual rates together. In other words, their total rate working together is lawns per hour. Substitute this value into the original rate formula and solve for t, the variable that represents time spent mowing. Therefore, it will take John and Julie hours, or 1 hour 12 minutes, to mow the lawn if they work together. 3. B. First, eliminate the denominators by multiplying both sides by x(x + 4). Then, simplify the result. The result is a quadratic equation. Solve it by factoring the left side and setting each factor equal to zero. Therefore, the possible solutions are x = –5 and x = 2. Unfortunately, there is a risk of finding an incorrect solution when solving rational equations in this manner. Consequently, the two possible solutions must be verified. To do this, substitute them into the given equations and make sure that the result is a true statement. Therefore, the solutions are x = –5 and x = 2. 4. C. First, factor out any common factors from each of the three terms, 6×3, -4×2, and -16x. Notice that the greatest common factor (GCF) of the coefficients is 2, and each term is divisible by x. Therefore, factor out 2x. Finally, factor the trinomial, 3×2 – 2x – 8, into two binomials. 5. C. To begin, rewrite the equation in the form ax2 + bx + c = 0 by subtracting 3 from both sides of the equation. Since the left side cannot be factored, use the quadratic formula to solve the equation, which is written in the form ax2 + bx + c = 0. For this equation, a = 5, b = 6, and c =–3. 6. E. To solve an equation by completing the square, manipulate it algebraically so that one side (in this case, the left side) is a perfect square trinomial and the other side (the right side) is a constant. Recall that a perfect square trinomial is a trinomial that can be factored as (ax + b)2or (ax – b)2. In the given equation, the left side only has two terms, an x2-term and an x-term; a constant term needed to make the expression a perfect square trinomial. To calculate that constant, divide the coefficient of the x-term (which is –12) by 2 (giving –6) and square the result ( (-6)2 = 36). Adding 36 to both sides of the original equation will complete the square: notice that x2 – 12x + 36 is indeed a perfect square trinomial because it can be factored as (x – 6)2. 7. C. An asymptote is a line that the graph of a function approaches but never touches. For a rational function like the given one, the vertical asymptotes are vertical lines that occur at every x-value for which the denominator is zero. For the given function, set up and solve an equation to determine when x2 – 8x + 15 is zero. Therefore, the vertical asymptotes are the lines x = 3 and x = 5. 8. D. Use the rate formula, , to find the answer. Let t represent the number of hours the second car travels. The second car will catch the first car when both have traveled the same distance. So, set the two formulas equal to each other and solve for t.
Therefore, the second car catches the first car six hours after it leaves. 9. E. The domain of a function is the set of all possible input values for the function. In this case, the input for f(x) is x. The easiest way to find the domain of f(x) is to figure out which x-values do not work (that is, give undefined output values) in the function. Then you can exclude those values from the domain. Examine the given function. 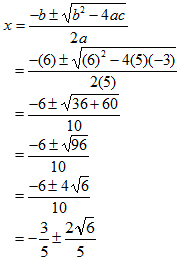 Notice that it does not contain a square-root sign, a logarithm, or a fraction with x in the denominator. Therefore, the function is defined for all real numbers. 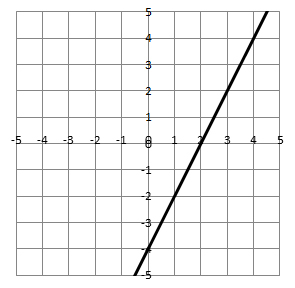 Notice from the graph below that the function can go to the left and right without end. Simplify the equation and solve for x. Thus, the solution is x = 3. Check this solution by substituting 3 into the original equation and making sure that the result is a true statement.